Last year, Tea Week culminated in a fun contest challenging readers to create dishes using tea as an ingredient. I loved seeing the versatility of tea through each of the entries. This year, I teamed up with Stash Tea and am hosting a giveaway instead of a contest. That means all of you are eligible to win! The wonderful folks at Stash Tea created a completely unique prize pack for a lucky Mission: Food reader (and tea-lover) to win! 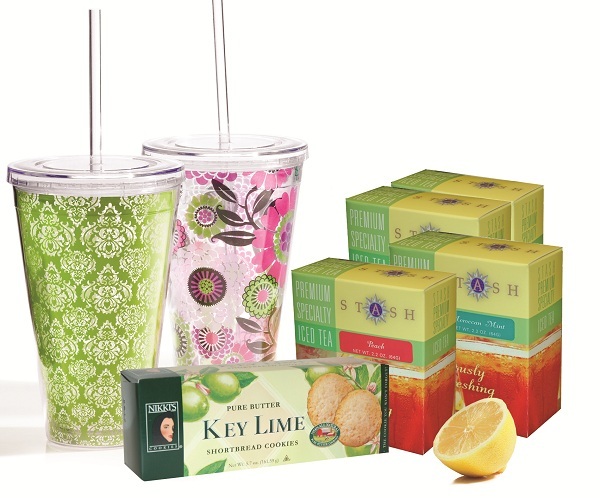 Two (2) double wall tumblers for iced tea in fun and colorful designs. They keep iced tea cold without the sweat. Each one features a dependable screw-on top and an extra-long, re-useable straw. Fits most car drink holders, so you can take it to go. Holds 24 oz. One (1) box Nikki's Key Lime Shortbread Cookies, perfect for enjoying with your tea. Stash Tea is also hosting a special Meyer Lemon Herbal Tea Recipe Contest on their website. Winners can win prizes such as a Kitchenaid Artisan Stand Mixer, a Le Creuset French Oven, and more. The contest ends June 17, 2011, so hurry up, visit their website to read up on the details, and submit your entries in order to be eligible for these wonderful prizes! To enter the Mission: Food giveaway, simply leave a comment telling me whether you prefer hot or iced tea, and what your favorite flavors are! In addition to this mandatory entry, there are several ways you can have bonus entries... do one of them or all of them, up to you! For each bonus entry, leave a separate comment telling me you did it. You do NOT need to have a blog to participate, but you MUST include your email address with your comments (just fill it out where it says "email" and it won't be visible to the public) so I can contact you if you win! Subscribe to my RSS feed either by email or reader (both are available on my right-hand sidebar), and leave a separate comment. If you already subscribe, just leave a comment. Add me on Google Friend Connect, and leave a separate comment. If you've already added Mission: Food, just leave a comment. Become a fan of Mission: Food on Facebook, and leave a separate comment. If you're already a fan, just leave a comment. Become a fan of Stash Tea on Facebook, and leave a separate comment. If you're already a fan, just leave a comment. Follow me and Stash Tea on Twitter @missionfood and @stashtea, Tweet about the giveaway (include a link to the post), and leave a separate comment. If you already follow us, Tweet about the giveaway and leave a comment. That's up to 6 total chances to win! Just leave separate comments for each entry. The giveaway ends at 11:59 pm EST on June 10th, in exactly 1 week. A number will be assigned to each qualifying comment and then a winner will be selected using a random number generator. I wish you all the best of luck! This is a really fun prize that I think everyone can enjoy! Good luck to everyone, and Happy Tea Week! An Ode to Meat: Welcome Grilling Season!